Area: 475,000 sq. km. (184,000 sq. mi. ), about the size of California. Cities (2008 World Gazetteer estimates): Capital — Yaounde (pop. 1.677 million). Other major cities — Douala (1.978 million), Garoua (519,000), Maroua (486,000), Bafoussam (348,000), Bamenda (486,000), Loum (221,000), and Ngaoundere (283,000). Terrain: Northern plains, central and western highlands, southern and coastal tropical forests. Mt. 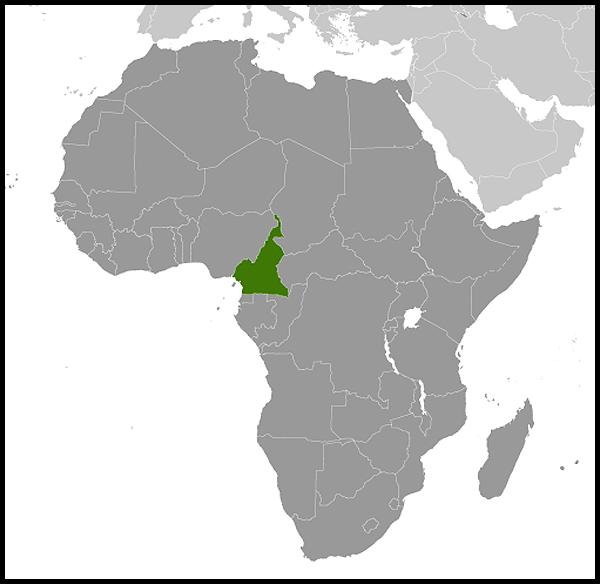 Cameroon (13,353 ft.) in the southwest is the highest peak in West Africa and the sixth in Africa. Climate: Northern plains, the Sahel region — semiarid and hot (7-month dry season); central and western highlands where Yaounde is located — cooler, shorter dry season; southern tropical forest — warm, 4-month dry season; coastal tropical forest, where Douala is located — warm, humid year-round. Nationality: English noun and adjective — Cameroonian(s); French noun and adjective — Camerounais(e). Annual population growth rate (2011 est. ): 2.12%. Religions: Christian 40%, Muslim 20%, indigenous African 40%. Languages: French and English (both official) and about 270 African languages and dialects, including pidgin, Fulfulde, and Ewondo. Education: Compulsory between ages 6 and 14. Attendance — 65%. Literacy — 76% (World Bank). Health: Infant mortality rate (2011): 60.91/1,000 live births. Life expectancy (2011) — 54.39 yrs. Work force: Agriculture: 70%. Industry and commerce — 13%. Type: Republic; strong central government dominated by president. Independence: January 1, 1960 (for areas formerly ruled by France) and October 1, 1961 (for territory formerly ruled by Britain). Constitution: June 2, 1972, last amended in 2008. Branches: Executive: president (chief of state), 7-year term, no term limits; appointed prime minister (head of government). Legislative — unicameral National Assembly (180 members; meets briefly three times a year — March, June, November); a new Senate was called for under constitutional changes made in early 1996, but has not yet been established. Judicial — falls under the executive's Ministry of Justice. Administrative subdivisions: 10 regions, 58 departments or divisions, 349 subprefectures or subdivisions. Political parties: Cameroon People's Democratic Movement (CPDM) or its predecessor parties have ruled since independence. Major opposition parties: the Social Democratic Front (SDF), the National Union for Democracy and Progress (UNDP), and the Cameroon Democratic Union (CDU). GDP (2010 current prices): $22.522 billion. Annual real GDP growth rate (2010):3.2%. GDP per capita (2010 current prices): $1,102. Inflation (2010 percent change in consumer prices): 1.3%. Natural resources: Oil, timber, hydroelectric power, natural gas, diamonds, cobalt, nickel, iron ore, uranium. Agriculture (2009): 18.9% of GDP. Products — timber, coffee, tea, bananas, cocoa, rubber, palm oil, pineapples, cotton. Arable land (2005 est.) — 12.54%. Manufacturing (2009): 44% of GDP. Services (2009): 50.4% of GDP. Trade (2010 estimate): Exports (goods): CFA 2.31 billion: crude oil, timber and finished wood products, cotton, cocoa, aluminum and aluminum products, coffee, rubber, bananas. Major markets — European Union, CEMAC, China, U.S., Nigeria (informal). Imports (goods) — CFA 2.28 billion: crude oil, vehicles, pharmaceuticals, aluminum oxide, rubber, foodstuffs and grains, agricultural inputs, lubricants, used clothing. Major suppliers — France, Nigeria, Italy, U.S., Germany, Belgium, Japan. Cameroon's estimated 250 ethnic groups form five large regional-cultural groups: western highlanders (or grassfielders), including the Bamileke, Bamoun, and many smaller entities in the northwest (est. 38% of population); coastal tropical forest peoples, including the Bassa, Douala, and many smaller entities in the Southwest (12%); southern tropical forest peoples, including the Ewondo, Bulu, and Fang (all Beti subgroups), Maka and Pygmies (officially called Bakas) (18%); predominantly Islamic peoples of the northern semi-arid regions (the Sahel) and central highlands, including the Fulani, also known as Peuhl in French (14%); and the "Kirdi", non-Islamic or recently Islamic peoples of the northern desert and central highlands (18%). The people concentrated in the Southwest and Northwest regions — around Buea and Bamenda — use standard English and "pidgin," as well as their local languages. In the three northern regions — Adamawa, North, and Far North — French and Fulfulde, the language of the Fulani, are widely spoken. Elsewhere, French is the principal language, although pidgin and some local languages such as Ewondo, the dialect of a Beti clan from the Yaounde area, also are widely spoken. 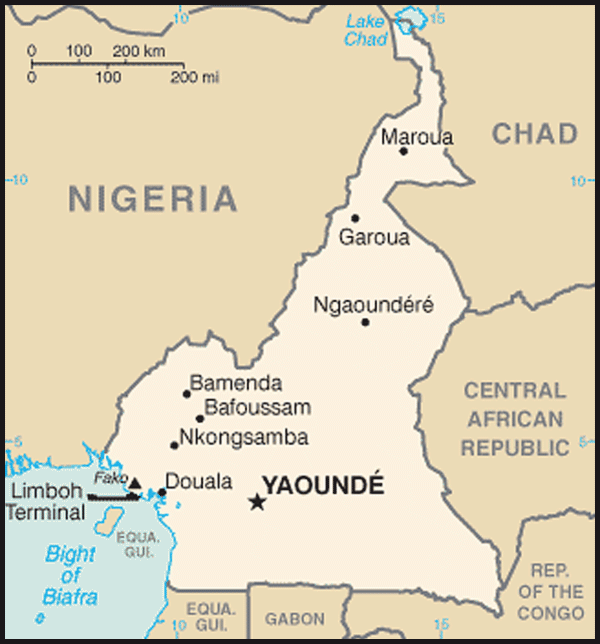 Although Yaounde is Cameroon's capital, Douala is the largest city, main seaport, and main industrial and commercial center. The western highlands are among the most fertile regions in Cameroon and have a relatively healthy environment in higher altitudes. This region is densely populated and has intensive agriculture, commerce, cohesive communities, and historical emigration pressures. From here, Bantu migrations into eastern, southern, and central Africa are believed to have originated about 2,000 years ago. Bamileke people from this area have in recent years migrated to towns elsewhere in Cameroon, such as the coastal regions, where they form much of the business community. About 20,000 non-Africans, including more than 6,000 French and 2,400 U.S. citizens, reside in Cameroon. The earliest inhabitants of Cameroon were probably the Bakas (Pygmies). They still inhabit the forests of the South and East regions. During the late 1770s and early 1800s, the Fulani, a pastoral Islamic people of the western Sahel, conquered most of what is now northern Cameroon, subjugating or displacing its largely non-Muslim inhabitants. Although the Portuguese arrived on Cameroon's coast in the 1500s, malaria prevented significant European settlement and conquest of the interior until the late 1870s, when large supplies of the malaria suppressant, quinine, became available. The early European presence in Cameroon was primarily devoted to coastal trade and the acquisition of slaves. The northern part of Cameroon was an important part of the Muslim slave trade network. The slave trade was largely suppressed by the mid-19th century. Christian missions established a presence in the late 19th century and continue to play a role in Cameroonian life. Beginning in 1884, all of present-day Cameroon and parts of several of its neighbors became the German colony of Kamerun, with a capital first at Duala (Douala) and later Buea and then Jaunde (present day Yaounde). After World War I, this colony was partitioned between Britain and France under a June 28, 1919 League of Nations mandate. France gained the larger geographical share, transferred outlying regions to neighboring French colonies, and administered the rest from Yaounde. Britain's territory — a strip bordering Nigeria from the sea to Lake Chad, with an equal population — was governed from Lagos. In 1955, the outlawed Union of the Peoples of Cameroon (UPC), based largely among the Bamileke and Bassa ethnic groups, began an armed struggle for independence in French Cameroon. This rebellion continued, with diminishing intensity, even after independence. Estimates of deaths from this conflict vary from tens of thousands to hundreds of thousands. French Cameroon achieved independence in 1960 as the Republic of Cameroon. The following year the largely Muslim northern two-thirds of British Cameroon voted to join Nigeria; the largely Christian southern third voted to join with the Republic of Cameroon to form the Federal Republic of Cameroon. The formerly French and British regions each maintained substantial autonomy. Ahmadou Ahidjo, a French-educated Fulani, became President of the federation in 1961. Ahidjo, relying on a pervasive internal security apparatus, outlawed all political parties but his own (the Cameroon National Union, CNU) in 1966. He successfully suppressed the UPC rebellion, capturing the last high-ranking rebel leader in 1970. In 1972, Ahidjo introduced a new constitution, which replaced the federation with a unitary state. Ahidjo resigned as President in 1982 and was constitutionally succeeded by his Prime Minister, Paul Biya, a career official from the Bulu-Beti ethnic group. Ahidjo later regretted his choice of successors, but his supporters failed to overthrow Biya in a 1984 coup attempt. Biya won single-candidate elections in 1984 and 1988 and flawed multiparty elections in 1992, 1997, 2004, and 2011. His Cameroon People's Democratic Movement (CPDM) party, formerly the CNU, holds a sizeable majority in the legislature following 2007 elections — 153 deputies out of a total of 180. The next parliamentary elections will take place in mid-2012. The 1972 constitution (amended in 1996 and 2008) provides for a strong central government dominated by the executive. The president is empowered to name and dismiss cabinet members, judges, generals, regional governors, prefects, sub-prefects, and heads of Cameroon's parastatal (about 100 state-controlled) firms, obligate or disburse expenditures, approve or veto regulations, declare states of emergency, and appropriate and spend profits of parastatal firms. The president is not required to consult the National Assembly. The judiciary is subordinate to the executive branch's Ministry of Justice. The Supreme Court, in the absence of a constitutionally mandated Constitutional Court, may review the constitutionality of a law only at the president's request. The 180-member National Assembly meets in ordinary session three times a year (March-April, June-July, and November-December), and seldom makes major changes in legislation proposed by the executive. Laws are adopted by a majority vote of members present or, if the president demands a second reading, of total membership. Following government pledges to reform the strongly centralized 1972 constitution, the National Assembly adopted a number of amendments in December 1995, which were promulgated in a new constitution in January 1996. The amendments called for the establishment of a 100-member Senate as part of a bicameral legislature, the creation of regional councils, and the installation of a 7-year presidential term, renewable once. One-third of senators would be appointed by the president, and the remaining two-thirds would be chosen by indirect elections. As of October 2010, neither the Senate nor the regional council had been created. In April 2008, the National Assembly acceded to constitutional changes proposed by the presidency that, inter alia, removed presidential term limits and provided the president with immunity from prosecution for acts committed while in office. 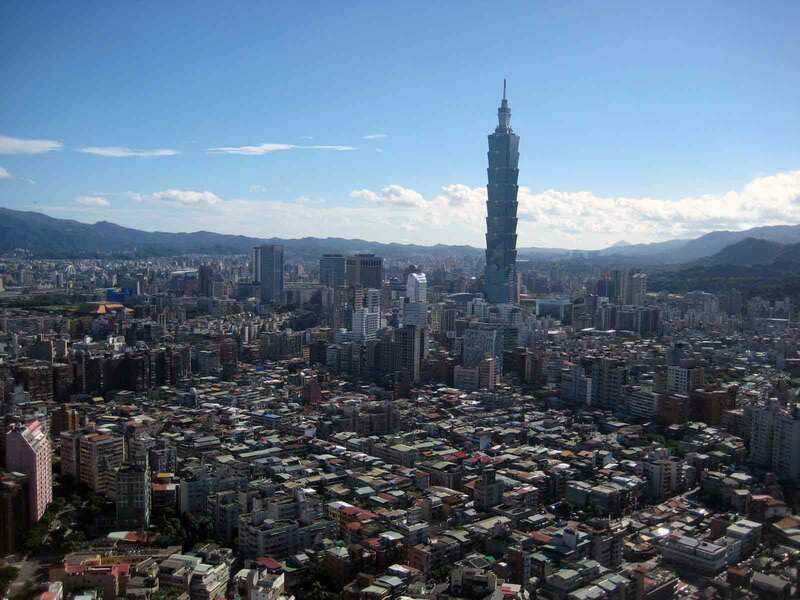 All local government officials are employees of the central government's Ministry of Territorial Administration, from which local governments receive most of their budgets. While the president, the Minister of Justice, and the president's judicial advisers (the Supreme Court) top the judicial hierarchy, traditional rulers, courts, and councils also exercise functions of government. Traditional courts still play a major role in domestic, property, and probate law. Tribal laws and customs are honored in the formal court system when not in conflict with national law. Traditional rulers receive stipends from the national government. The government adopted legislation in 1990 to authorize the formation of multiple political parties and ease restrictions on forming civil associations and private newspapers. Cameroon's first multiparty legislative and presidential elections were held in 1992. Because the government refused to consider opposition demands for an independent election commission, the three major opposition parties boycotted the October 1997 presidential election, which Biya easily won. Each of Cameroon's national elections has been marred by severe irregularities. In December 2000, the National Assembly passed legislation creating the National Elections Observatory (NEO), an election watchdog body. NEO played an active role in supervising the conduct of local and legislative elections in June 2002 and July 2007, which demonstrated some progress but were still hampered by irregularities. The NEO also supervised the conduct of the presidential election in October 2004, as did many diplomatic missions, including the U.S. Embassy. The incumbent, Paul Biya, was re-elected with 72% of the vote. NEO reported that it was satisfied with the conduct of the election but noted some irregularities and problems with voter registration. The U.S. Embassy also noted these issues with the election, as well as reports of non-indelible ink, but concluded that the irregularities were not severe enough to impact the final result. The U.S. Embassy provided monitors for the July 2007 parliamentary and municipal elections and concurred with the analysis of other observers and diplomatic missions, who noted some improvements but persistent flaws, especially in the registration of voters and the prevention of voter fraud. In December 2006, the President enacted the law creating Elections Cameroon (ELECAM), an independent body in principle that is responsible for the organization, management, and supervision of all election operations and referendums. In December 2008, Biya appointed 12 members to the ELECAM Council, 10 of whom were from the President's CPDM party. This weakened public confidence in the commission that lingered even beyond the President's 2011 appointment of six additional members from civil society. In 2010 and 2011, the National Assembly amended legislation in order to allow overseas voting and to permit political parties to play a more significant role in the electoral process, notably at the level of the various commissions that will govern voter registration, vote count, and disputes. The amendment also empowered the Directorate General of Elections, the technical branch of ELECAM. These important reforms notwithstanding, the 2011 presidential elections suffered from many of the same problems related to registration, indelible ink, allegations of multiple voting, and other irregularities. Again, international observers did not consider the results to be significant to the outcome. Biya won with approximately 78% of the vote. Cameroon has a number of private newspapers, radio stations, and private television stations. Censorship was officially abolished in 1996, but the government has on occasion seized or suspended newspapers, radio stations, and television stations. Because libel is a criminal (rather than civil) offense, journalists are occasionally imprisoned for articles that are critical of the government or senior government officials. Radio and television continue to be a virtual monopoly of the state-owned broadcaster, the Cameroon Radio-Television Corporation (CRTV). However, there are several independent television stations and many more regional private radio stations, although many are owned by or financed by parliamentarians, mayors, or party officials. Since the issuance of the decree authorizing the creation of private radio and television on April 3, 2000, only two stations have received a license from the government. Licensing fees are more than $100,000 for radio stations and $200,000 for television stations, which many in the press consider exorbitant. There are a dozen community radio stations created and supported by the UN Educational, Scientific, and Cultural Organization (UNESCO) and local councils, which are exempted from licenses and have no political content. Radio coverage extends to about 80% of the country, while television covers 60% of the territory. Despite strong civil rights on the books, the government recurrently infringes upon rights and liberties in practice. Discrimination against women, homosexuals and indigenous peoples is pervasive. There is very little distinction between the CPDM party and the Cameroonian Government, and the government uses patronage and intimidation to limit political debate. Similarly, the rights to assemble and of association are often curtailed according to ideology and political alignment. The public's ability to seek recourse from the courts remains minimal due to insufficient resources and physical access, and corruption. Government prisons are at times life-threatening, plagued by overcrowding, poor sanitation, and corruption by security forces. Reports of torture, excessive force, unlawful arrests and detention, and unlawful killings by police and security forces persist, although the GRC has made some progress in holding security officials accountable. The government has made some strides to address human trafficking and forced labor. Cameroon maintains an embassy (http://www.cameroonembassyusa.org/) in the United States at 1700 Wisconsin Avenue NW, Washington, DC 20007 (tel. : 202-265-8790). Cameroon is endowed with an abundance of natural resources, including in the agricultural, mining, forestry, and oil and gas sectors. Cameroon is the commercial and economic leader in the sub-region, although regional trade, especially with Nigeria, remains under-realized. Cameroon's economy is highly dependent on commodity exports, and swings in world prices strongly affect its growth. Cameroon's economic development has been impeded by economic mismanagement, pervasive corruption, and a challenging business environment (for local and foreign investors). Cameroon remains one of the lowest-ranked economies on the World Bank's annual Doing Business and similar surveys and regularly ranks among the most corrupt countries in the world. Over the last 3 years, GDP growth has averaged around 2%-3%, which is roughly on par with population growth but not enough to significantly reduce high poverty levels. Despite boasting a higher GDP per capita than either Senegal or Ghana, Cameroon lags behind these two countries in important socio-economic indicators, including health and education. The government has professed a determination to foster urgent economic growth and job creation, and there is a decided uptick in interest in the mining sector and infrastructure development, but it is not yet clear how well these promises will translate into improved performance. For a quarter-century following independence, Cameroon was one of the most prosperous countries in Africa. The drop in commodity prices for its principal exports — oil, cocoa, coffee, and cotton — in the mid-1980s, combined with an overvalued currency and economic mismanagement, led to a decade-long recession. Real per capita gross domestic product (GDP) fell by more than 60% from 1986 to 1994. The current account and fiscal deficits widened, and foreign debt grew. The government embarked upon a series of economic reform programs supported by the World Bank and International Monetary Fund (IMF) beginning in the late 1980s. Many of these measures have been painful, including the government's slashing of civil service salaries by 50% in 1993. The CFA franc — the common currency of Cameroon and 13 other African states — was devalued by 50% in January 1994. The conjunction of these two events meant an overall drop in purchasing power of nearly 65%. The government failed to meet the conditions of the first four IMF programs. A three-year Poverty Reduction and Growth Facility (PRGF) approved by the IMF in October 2005 ended in 2008. Cameroon has not negotiated any new IMF program but is continuing cooperation with the Fund under Article IV consultations. In 2009, the IMF disbursed $144 million to Cameroon under its Exogenous Shocks Facility to help with the effects of the global economic crisis. In 2010, Cameroon issued its first sovereign bond, raising, approximately $400 million for special projects. Inflation remains low in Cameroon, as many basic commodities, including fuel and food items, are either subsidized or subject to government price controls. Public frustration over rising prices was partly to blame for an outbreak of social unrest and violence in many Cameroonian cities in February 2008. In March 2008, the government announced a reduction in food import tariffs and other measures designed to reduce the cost of basic commodities. The government also began subsidizing fuel at the retail level in 2008, leading to massive yearly government expenditures. Experts estimate the fuel subsidy will consume ten percent of the government budget in 2011. The global economic crisis has seriously impacted Cameroon's oil, cotton, timber, and rubber sectors, depressing exports, growth, and overall consumption. The European Union is Cameroon's main trading bloc, accounting for 41.1% of total imports and 55.1% of exports (vy value), according to government statistics. France and China are Cameroon's main trading partners, but the United States is a leading investor in Cameroon (largely through the Chad-Cameroon pipeline and energy provider AES Sonel). According to press reports, China recently became the number one importer of Cameroonian exports, especially unprocessed timber. U.S. exports to Cameroon were approximately $132 million, reflecting approximately 4% of total imports to Cameroon in 2010. Cameroonian exports to the United States, that same year, were approximately $297 million (or about 5.7% of total Cameroonian exports). For further information on Cameroon's economic trends, trade, or investment climate, contact the International Trade Administration, U.S. Department of Commerce, Washington, DC 20230 and/or the Commerce Department district office in any local federal building. The Cameroonian military generally has been an apolitical force dominated by civilian control. International military advisers remain closely involved at senior levels of all the armed forces and the gendarmes. The armed forces number approximately 28,000 personnel in ground, air, and naval forces, with the majority being in the army and gendarmes. The goal of the Cameroonian military is to improve the security of its maritime and land borders as well as to develop a force with the capacity to contribute to peacekeeping operations. While equipment needs pose a significant challenge, Cameroonian officers are already receiving peacekeeping training both in Africa and abroad through multilateral partnerships. Cameroon's non-contentious, low-profile approach to foreign relations puts it squarely in the middle of other African and developing states on major issues. It supports the principle of noninterference in the affairs of third countries and increased assistance to underdeveloped countries. Cameroon voting record at the United Nations demonstrates its commitment to causes that include international peacekeeping, environmental protection, and Third World economic development. In the UN and other human rights fora, Cameroon generally abstains from contentious votes. Cameroon enjoys good relations with the United States and other developed countries. It has particularly close ties with France, with whom it has numerous military, economic, and cultural agreements. China has a number of health and infrastructure projects underway in Cameroon, and provides some military assistance. Cameroon enjoys peaceful relations with its African neighbors. Cameroon successfully resolved its border dispute with Nigeria in the oil-rich Bakassi Peninsula through peaceful legal means after having submitted the case to the International Court of Justice (ICJ). With the support of the UN, both countries worked closely together to peacefully implement the ICJ ruling, and a genuine, peaceful turnover of the peninsula by Nigeria was completed on August 14, 2008. In December 2009, both countries laid the first pillar to demarcate the border. Cameroon is a member of CEMAC (Economic and Monetary Community of Central Africa) and has supported UN peacekeeping activities in Africa (Sudan, Central African Republic) and Haiti. U.S.-Cameroonian relations are positive, although from time to time they have been affected by concerns over human rights abuses and the pace of political and economic liberalization. The bilateral U.S. Agency for International Development (USAID) program in Cameroon closed for budgetary reasons in 1994 but USAID runs a number of programs in Cameroon, mainly through its regional office in Accra, Ghana, and primarily in the health sector. The Centers for Disease Control (CDC) also has activities in Cameroon, mainly in HIV/AIDS prevention. In 2010, U.S. assistance to Cameroon totaled over $26 million. Approximately 220 Peace Corps volunteers work successfully throughout all 10 regions of the country in five (5) program sectors: agroforestry, community health, t, education and information technology, small business development, and youth development (focused primarily on girls and young women). The Public Affairs section of the U.S. Embassy in Yaounde organizes and funds diverse cultural, educational, and informational exchanges. It maintains a library and helps foster the development of Cameroon's independent press by providing information in a number of areas, including U.S. human rights and democratization policies. The Embassy administers both the Ambassador's Special Self-Help (SSH) and Democracy and Human Rights Fund (DHRF) programs and the Ambassador's Fund for Cultural Preservation. Through several State Department and USAID regional funds, the Embassy also provides funds for biodiversity protection, refugees, HIV/AIDS, democratization, and girl's scholarships.